Skycast Solutions Announces Launching of The "TrayVu 9"
Alaska Airlines will begin offering the tablet on select fights in First Class Today. 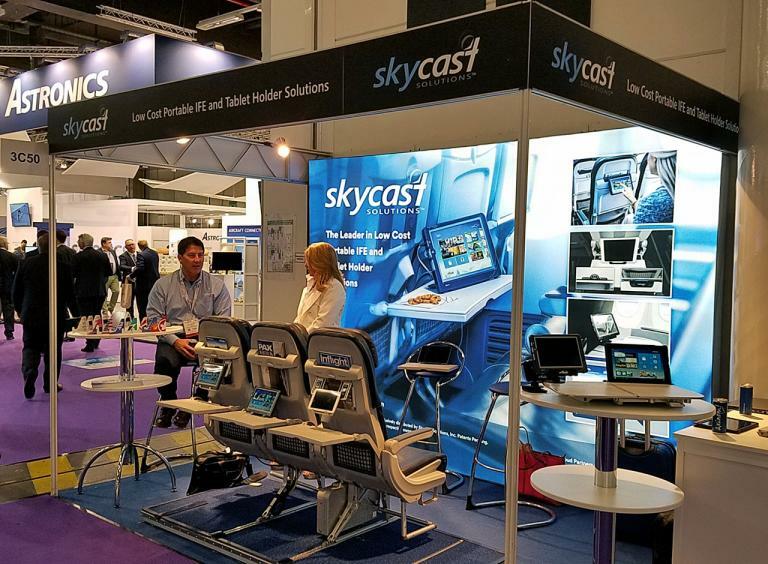 HAMBURG – April 10, 2018 – Skycast Solutions today announced the launch of its latest portable IFE tablet. The new tablet features a 9” screen and is designed with premium class distribution in mind. The tablet will debut with Alaska Airlines on select flights in First Class today. Alaska Airlines currently operates over 7,000 of Skycast’s 8” portable IFE tablets on routes over 3.5 hours and will soon operate over 1,500 of the new premium tablets on long-haul flights in First Class. The Windows device features a high resolution 9” screen and runs on the Windows 10 IoT operating system with a fast Intel® Atom™ processor. The tablet is encased in a protective aluminum security shell that features an integrated stand. Skycast worked with partner Microsoft and custom tablet maker Minno on the new device. Globant – a leading multi-screen agency in Seattle was tapped again to develop the user friendly interface and configure the tablet for the particular requirements of inflight entertainment. Like Skycast’s other tablet, it was designed to be easily updated in terms of content and software.